Recently we took a trip along the Oregon/California coast from Reedsport to San Francisco. On our way south we drove along the Avenue of the Giants in the Humboldt Redwoods State Park. 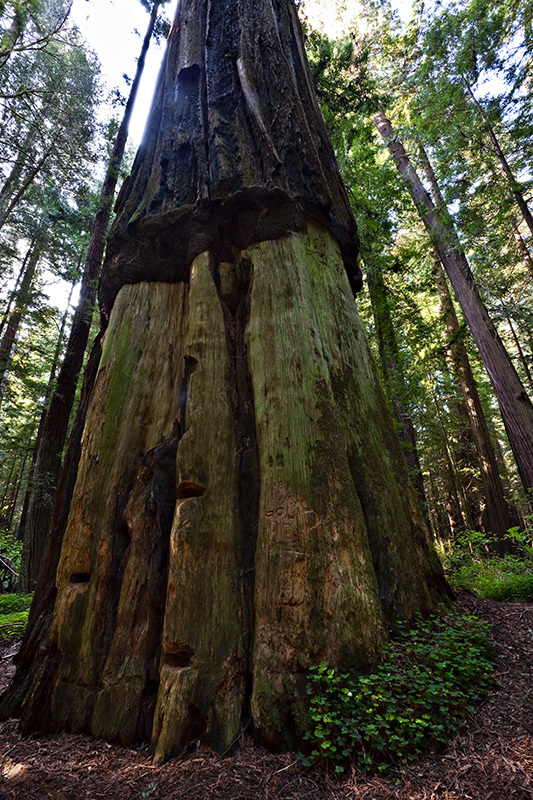 The park encompasses about 53,000 acres of which about 17,000 acres contain old growth redwood forests. The 10,000 acres Rockefeller Forest which is within this park is the largest contiguous old growth redwood forest in the world. The Avenue of the Giants is a 32 mile scenic drive winding it’s way through the park. Originally built as a stagecoach and wagon road in the 1880’s it’s a great scenic break from Highway 101. We drove this beautiful stretch of road in the morning and the light streaming through the forest created an interesting effect. This photo was taken at a pull-off for the access trail to Thomas A Greig, Enoch Percy French, Winifred Brown Bell stand. Within this stand is “Girdled Tree” which is a living tree with it’s bark peeled off at the base. This was done in 1901 by Enoch Percy French and his sons to be used for an information booth for the Epworth League Convention in San Francisco. Before the bark was peeled the tree measured 54 feet in circumference. It’s hard to get a good perspective from a photograph on how large these trees really are. I mean at 54 feet in circumference this tree is just massive. It towers up into the sky disappearing into the blinding light of the sun. It’s amazing to just sit amongst these giants. Just sit and close your eyes and listen to the sounds of the forest. There are birds calling, the sound of a slight breeze moving through the forest canopy. You can even hear the sound of twigs and needles falling from above. 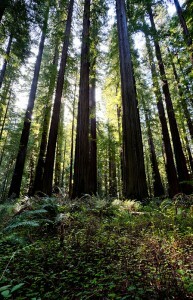 If you want a place to meditate and relax a redwood forest will do nicely. If you are driving south on Highway 101 through this area take exit 674 for Avenue of the Giants and take the time to drive slowly through this area and stop frequently to really take it all in and appreciate the magnitude of these towering forests of redwoods. It really is an amazing experience and one you will never forget. 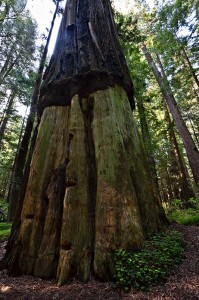 Along the way you will also pass through several small towns like Redcrest where you can view the Eternal Tree, which is a 20-foot room in a living redwood. Other towns like Myers Flat, Weott and Phillipsville offer services and unique artwork. For me I am glad that my kids had an opportunity to take it all in. While they may not fully appreciate it at their young age I am glad that they at least got to walk through a redwood forest and stand amazed at the sheer size of these trees. This post is catching up on my Project 365 posts which were delayed due to traveling.